The European Rosetta probe is set to encounter a small asteroid called Steins on 5 September. This flyby—halfway to the probe’s ultimate target, comet Churyumov-Gerasimenko—will provide an opportunity to gather key information about a still poorly understood family of asteroids. 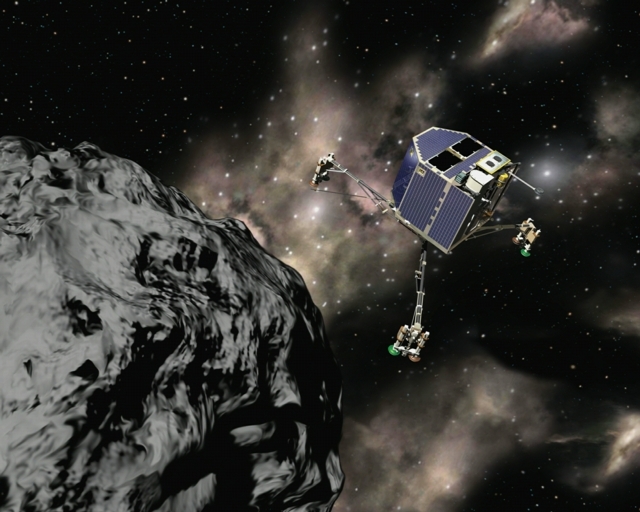 The Rosetta probe will fly past the asteroid to within 800 km at closest approach. Credits: ESA/AOES Medialab. Philippe Gaudon, Rosetta project leader at CNES, is excited at the prospect of the asteroid flyby: “There are only 20 asteroids of this type out of the 165,000 or so currently known and this is the first opportunity we’ve had to look at one up close,” he says. Gaudon has been keeping track of Rosetta since launch in 2004 and has been awaiting this 1st rendezvous expectantly. 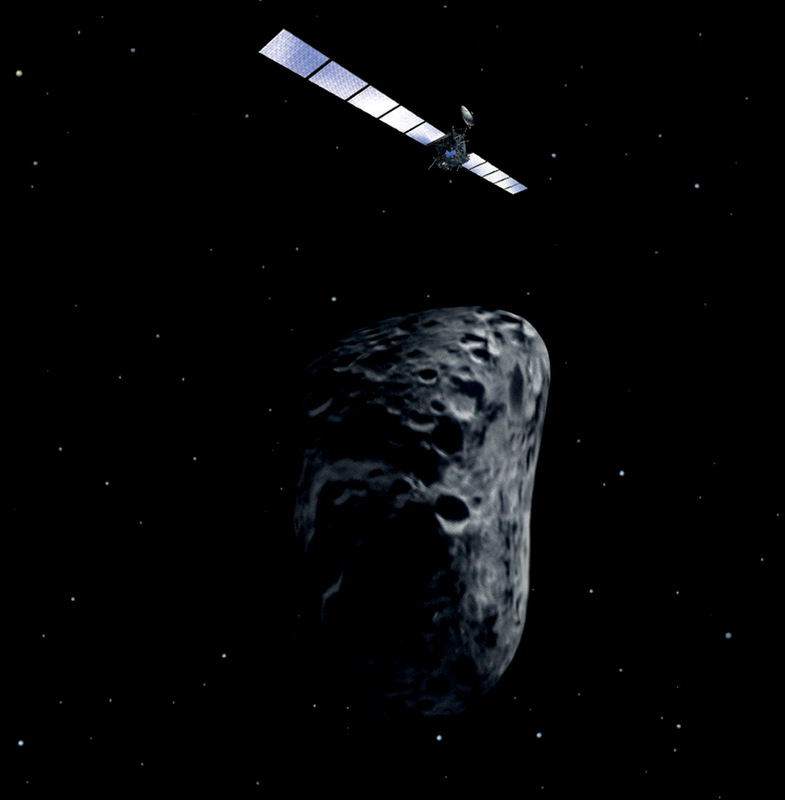 The probe plans to encounter 2 asteroids during its 10-year journey, when it flies through the main asteroid belt between the orbits of Mars and Jupiter. The 1st encounter will take place on 5 September with Steins, a small celestial object just 5 km across. 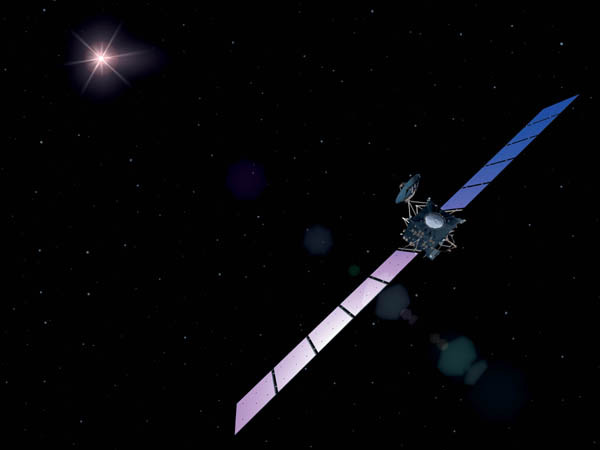 Rosetta will fly by the asteroid to within 800 km at closest approach, at 20:37 CET and at a speed of 8 km/s. Some of its instruments will take photos of the surface of Steins at different wavelengths and at a resolution of a few metres. Rosetta began its voyage in 2004. Credits: ESA/AOES Medialab. “These pictures will reveal the asteroid’s shape and enable us to determine its composition more precisely, which we think is mainly silicates low in iron. And the number and location of craters on the surface will tell us more about its history,” explains Philippe Gaudon. Scientists hope the precious data acquired will help them to better understand how asteroids in the inner solar system formed and evolved, to enhance our knowledge about a space environment relatively near Earth. Release of the Rosetta lander in 2014. Credits: CNES. 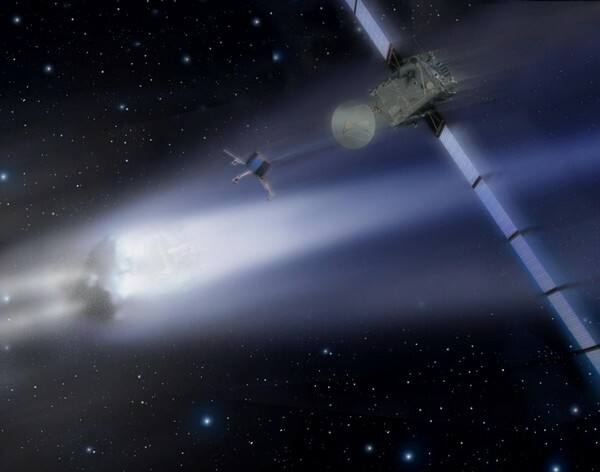 On reaching Churuymov-Gerasimenko in 2014, the Rosetta spacecraft’s orbiter will lock onto the comet and its lander, Philae, will touch down on the surface. The orbiter will acquire pictures of the comet’s surface, analyse the gases and dust in its tail and probe its core. Philae will also take samples and perform numerous analyses in situ. The Philae lander approaching comet Churyumov-Gerasimenko. Credits: CNES/Ill. Laurence Mossay. Scientists hope to find complex and varied molecules in the ice on the core’s surface or in the dust in the comet’s tail. Such a discovery would support the hypothesis that comets helped to seed life on Earth.